Ages ago I received a box of John Frieda I was most impressed with the frizz-ease 3 day straight. When I picked this up I was quite fascinated as I have never seen anything like it. It is basically a semi permanent styling spray. Now my hair is rather unruly I battle with frizz and my hair has slight waves so I either need to curl or straighten it for it to look decent. A few spritzes of this in my hair and even without a the use of a hair tool my hair looks significantly straighter. It just says use with a straightener but I tried and it works really well with curls too. This is basically a perm in a bottle it keeps my hair shape for 3 days or until your next wash whichever is earlier. It feels weightless on the hair and includes a heat protectant I don’t even need to use a styling spray to hold the style (I try to avoid styling spays and gel since I feel it makes my hair stiff and unnatural). It contain ingredients like keratin protein which wraps each strand sealing in the style. Hair looks glossy, smooth and full of body. You will be glad to know it is safe for colour and chemically treated hair. How you use it is wash and condition hair as normal, spray it on wet hair, blow dry and style. 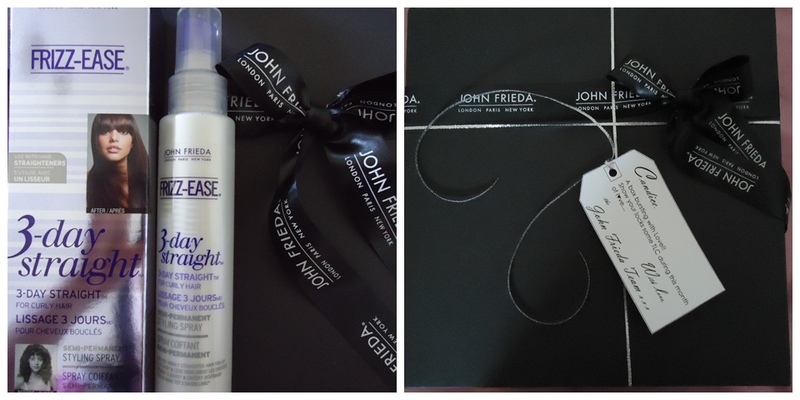 John Frieda is always a brand I trust as it is affordable and has different ranges to suit any need. Plus their products are innovative. Products can be found at Clicks and the RSP for the 3 day straight spray is R150.